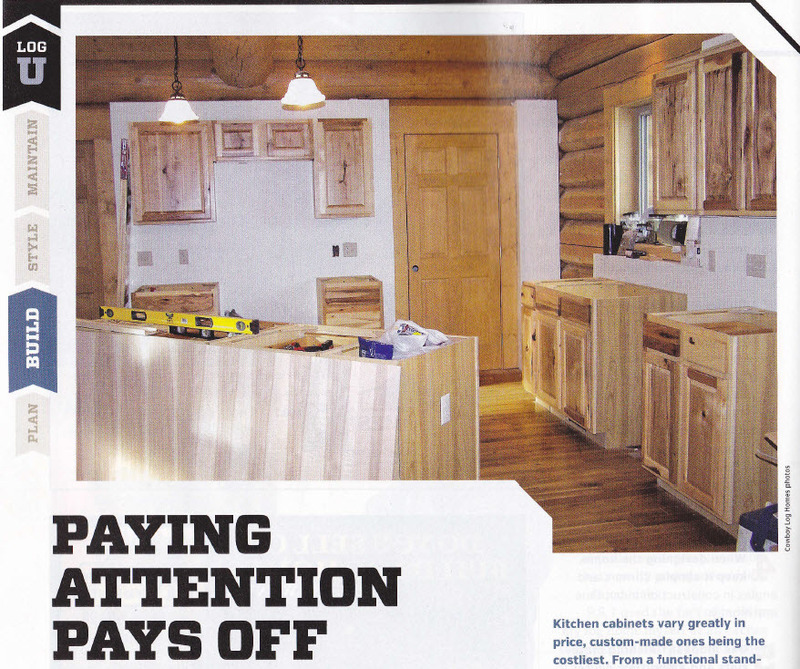 We are proud to have supplied a few photos for the Log Home Living July 2015 issue. These photos showcase a log home under construction, but with materials that are not as expensive as some on the market. When the home below was built the owners chose the large diameter handcrafted logs because they fell in love with them. But the owners also were wise and strove to keep other costs down. So let’s take a look at some of the features below. 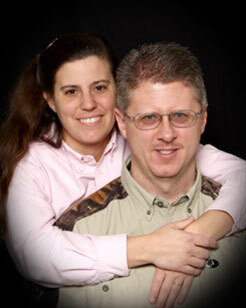 Log home kitchens can either be very reasonable in cost, or they can about bankrupt a project. We have seen more log homes ‘die’ in the idea stage because people are not willing to have anything less than the top-of-the-line. From Viking stoves and ranges, to marble counter tops, to handmade cabinets the costs can go from reasonable to astronomical very quickly. The kitchen is a vital room in the home. Often people will opt for smaller bedrooms and a large gourmet kitchen, but still the components you choose for the kitchen may make or break a home project. In this kitchen above the owners chose Hickory cabinets. Sounds expensive? Well, these really were pretty reasonable. This set of cabinets were purchased as pre-made units. They look lovely. No, they do not have handmade dovetail corners on the drawers. But the cabinets function well and serve all the needs of the homeowner. I am adding a photo here of the counter tops. The owners chose a nice Formica top with a Hickory edge. 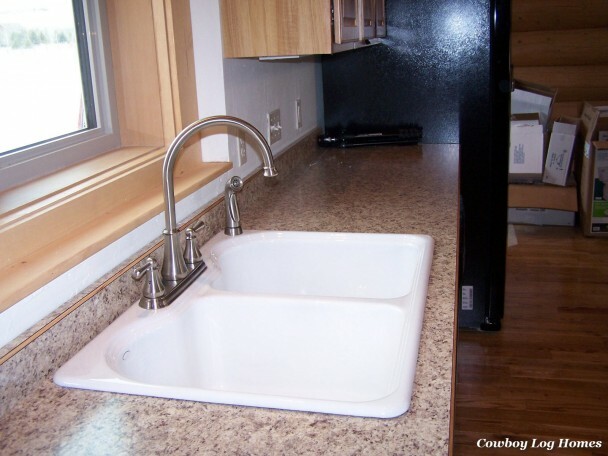 Everyone asks if it is a solid surface– commonly mistaking it for granite. This top has a sight textured feel with a back splash. A lovely nickel faucet also complements this kitchen. This is a photo of the kitchen entirely finished. The owners also chose black appliances with a side-by-side frig, microwave over stove, range, and dishwasher. 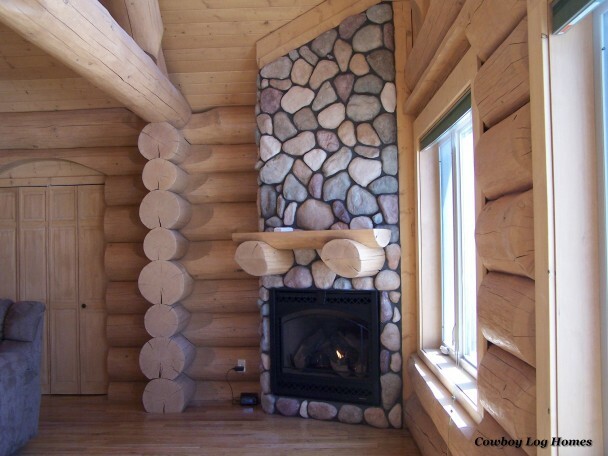 Fireplaces are always so desirable in a log home. 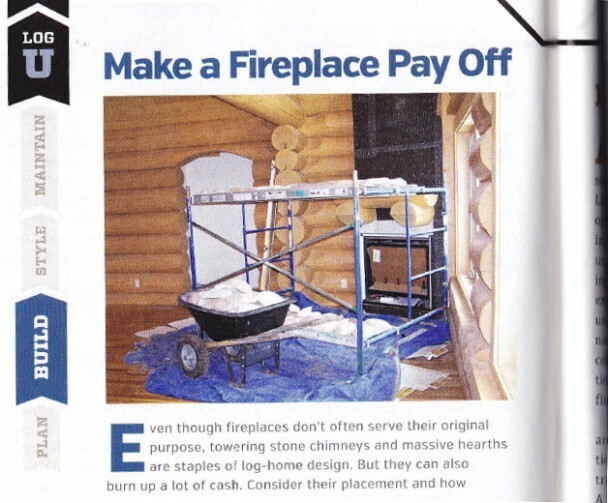 A masonry (cement) fireplace is the traditional method of construction, but it has many drawbacks. The first being the cost. The second is the excessive weight. A masonry chimney and stone fireplace must be supported structurally in the foundation level. The fireplace here looks so ‘real’ but it has some secrets behind the wall. The chimney is framed and covered with metal lathe. Then flat-backed cultured stone, in a river rock pattern, is installed. For the fireplace itself a zero clearance unit with a propane unit was installed. A zero clearance fireplace “box” can be either propane or wood burning. It is designed to be slid right up against a framed wall and then enclosed around. Here is a photo of the fireplace entirely finished. The zero clearance unit, framed chimney, and cultured stone option moved the fireplace from the “wish” list side of the homeowners’ budget, to the “I can afford it!” column. So where are your log home dreams leading you? Are you making plans now to ensure that a log home can be able to ‘hit the road’ and head your way someday? Log homes can vary widely in total construction costs depending on choices YOU make for finish materials, as we see here. 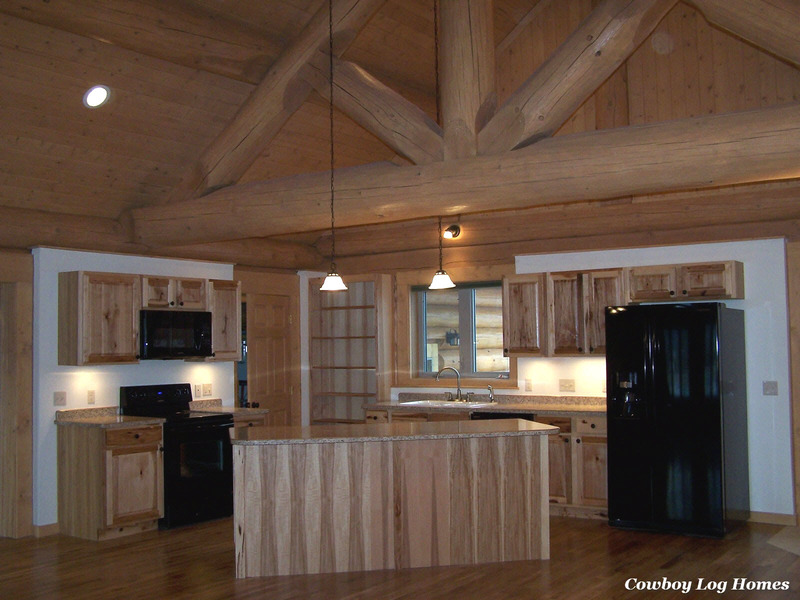 These homeowners proved that you don’t have to have the most expensive finish options in order to have a lovely log home.